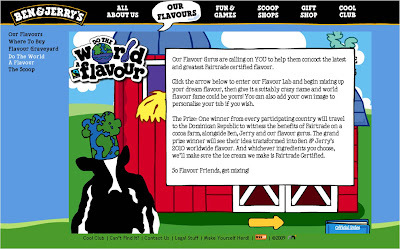 User generated flavour competitions - Walkers, Dorito's, Jelly Belly and now Ben & Jerry's! All slight variants on a theme, but user generated flavour marketing seems to be the big thing at the moment. Walker's Crisps are in the final stages of their 'Do Us A Flavour' campaign in the UK, Dorito's are about to announce the winner of their name the flavour competition in Canada, Jelly Belly ran a 'what's your favourite flavour' competition and Ben & Jerry's have just launched a global 'Do The World A Flavour' campaign. Walkers Crisps 'Do Us A Flavour' competition is a long running, multi-faceted promotion. First there was a competition for consumers to submit their own flavour and a shortlist of 6 flavours was drawn up and put into production. The public can now vote for their short-list favourite and the creator of the winning flavour will win £50,000 + 1% of the future sales of their flavour. 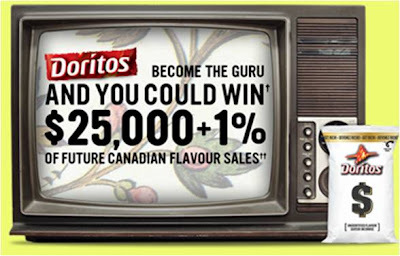 In Canada Dorito's have been running a competition called Become The Dorito's Guru and have been selling packets of Dorito's marked with 'Unidentified flavour'. Consumers have been offered the chance to name the flavour and upload a short film about what inspired them to choose the name. 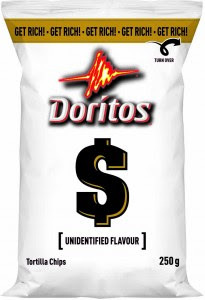 "The Doritos® Guru will then have their idea turned into a polished 30-second ad to be aired on for-real TV, see their flavour name emblazoned on the bag and of course, take home $25k and 1% of future net sales of this flavour name in Canada." In January 2009 Jelly Belly launched a Flavour competition to win a trip to New York - users just had to name their favourite and least favourite Jelly Belly flavour. Can you spot the theme? Are there any more examples for this list?